SAB Plumbing and Heating - Central Heating Engineer, Plumber based in Norton, Suffolk. 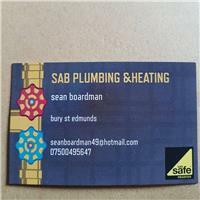 My name is Sean Boardman from SAB Plumbing and Heating. I live in Norton near Bury St Edmunds. I cover an area of 25 miles from my postcode. I've been a plumber and heating engineer since 1986 and have covered all areas of the industry. I can provide services from fixing a dripping tap to a full heating system. I'm a sole trader but can be contactable during the day. I'm gas safe registered. Bury St. Edmunds, Ipswich, Newmarket, Sudbury, Thetford and surrounding villages.